Triangles have a particularly significant role to play in mathematics. In this unit, the concept of similarity will be described in a mathematical context, and tools to check for similarity will be learned. A review of Pythagorean Theorem will precede a more advanced discussion of triangles. This unit is all about triangles and how they can be used to describe many phenomena in the universe. Sine, cosine and tangent ratios will be examined, as will the ability to solve problems using these tools. To progress beyond a certain point in any mathematics, some fundamental skills must first be mastered. In this unit, strategies for performing measurement conversions will introduce the larger topic of solving equations. By the end of the unit, successful students will be able to solve multi-step equations and more than one variable. Linear relationships are not only important to understand for everyday use, but they are also important for understanding the interplay between distance in time for the calculation of speed, or rates of change in business, for example. They are also foundational to more complex forms of mathematics. This unit reviews the concepts of linear algebra that were developed in Grade 9, and expands upon important procedures such as rearranging equations and developing accurate graphs. It is often important, for various practical reasons, to know where on a graph two lines intersect. This unit is all about how to determine this intersection point, not just graphically, but through the language of mathematics. 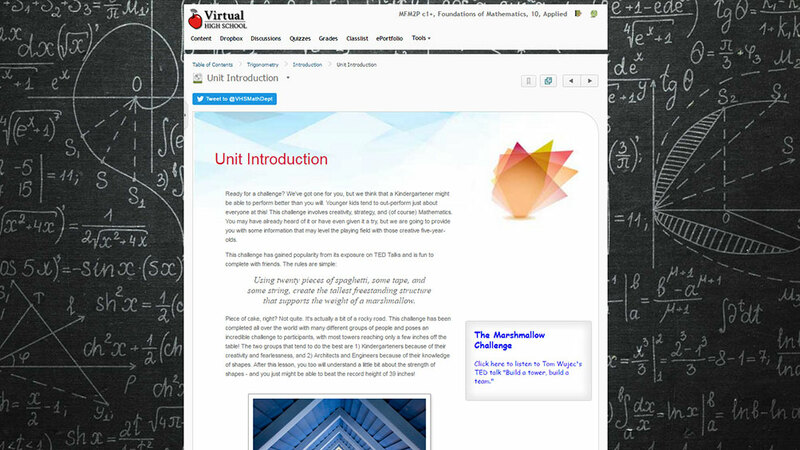 In this unit, students will consider various operations on monomials, binomials and polynomials. Manipulating differences of squares and factoring trinomials will also be explored and these skills will be applied to different situations. Until this point, all algebraic relations that have been considered have been linear. In this unit, second-order functions are introduced. Students investigate vertices and axes of symmetry, along with intercepts and direction of opening. They discover the links between parameters in equations and features of their curves, and use them to sketch parabolas. A3 solve problems involving the surface areas and volumes of three-dimensional figures, and use the imperial and metric systems of measurement. B3 solve systems of two linear equations, and solve related problems that arise from realistic situations. C3 solve problems by interpreting graphs of quadratic relations. Problem Solving: This course scaffolds learning by providing students with opportunities to review and activate prior knowledge (e.g. reviewing concepts related to linear equations from prior mathematics courses), and build off of this knowledge to acquire new skills. The course guides students toward recognizing opportunities to apply knowledge they have gained to solve problems. Connecting: The course connects the concepts taught to real-world applications, such as using trigonometric concepts to solve for heights and distances.